We set out 3 months ago to find the best BBQ chicken recipe in the world and we believe that we have succeeded. Come rain or shine there we were, stuffing our faces with chicken every day on our mission. So have little respect please and don't burn your chicken when you are using this recipe. We will be most dissapointed in you. Now don't tell me that doesn't look like the best BBQ Chicken you have ever seen!? Combine about 3/4 a up of the hot pepper sauce with the vineger, crushed garlic, honey, parika, worcester sauce, spring onion and some salt and pepper in a sauce pan and simmer on a low heatfor about 15 minutes, stirring occasionally. It should reduce in size by nearly half and turn nice and thick. Now transfer the sauce into a bowl and add the chicken parts and let marinade for as long as possible. 30 minutes is sufficient though. Add the chicken, with as much sauce on as possible, onto the BBQ and cook it gently unitll it is cooked through. Every couple of minutes turn the chicken over and the spoon on more of the marinade until it has all gone. 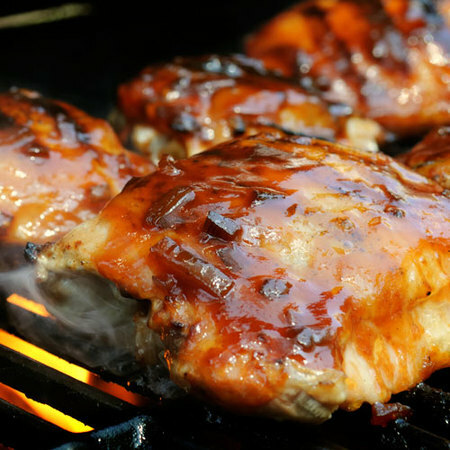 Let su know how you got along with the best BBQ Chicken recipe in the world.